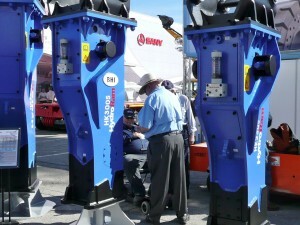 RJ Hydraulic Hammers and Heavy Parts was a featured exhibitor at ConExpo 2014 in Las Vegas. Our full line of Hydro Ram brand hammers was on display in the Silver Lot. We were able to meet with many of our established customers from around the world, and we also made many new friends and customers this year. Please give us a call with any questions about Hydraulic Hammers, Attachments, or Heavy Excavator Parts. We are available 365 days a year! Please call us at 1-888-651-0187.